Sensible. Stable. Superior risk-adjusted returns. These words are often used to describe dividend investing, or strategies that seek to identify companies which regularly distribute profits as cash to shareholders. While it sounds attractive, too much of a focus on income can cause a portfolio to become less tax efficient, more limited in terms of growth, and overly concentrated as compared to a portfolio that is concerned with total return, that is both the appreciation of asset prices in addition to income. Some investors believe that if they only spend the cash dividends that stocks pay, they never have to touch their initial principal. What may not be obvious to these investors is that the price of a stock that pays a dividend is immediately adjusted after the dividend is paid. This occurs because the value of the company declines exactly by the amount of the dividend payment. 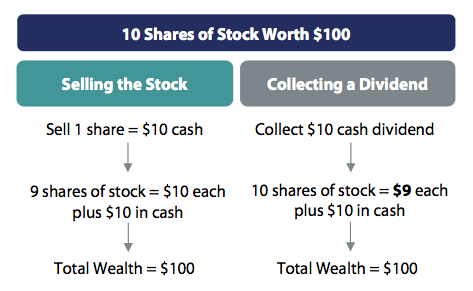 Taking a simple example, suppose a company has 10 shares of stock outstanding and an equity value of $100 so that the share price is $10 ($100 equity divided by 10 shares). The company then decides to pay a $10 dividend. The company’s equity is reduced to $90 and the stock price is now $9 a share ($90 equity divided by 10). In other words, after a dividend payment, the investor’s principal is effectively reduced by the amount of the dividend. While emotionally it may feel better to collect a dividend, there is no difference in ending wealth between collecting a dividend and selling an equivalent amount of stock. But to say that an investor should be indifferent between selling stock versus collecting a dividend would not be accurate because it ignores the impact of taxes. While the tax rate on dividends is the same rate applied to long-term capital gains, the difference is that the entire dividend is taxed whereas when selling stock, only the portion that represents a capital gain is taxed. 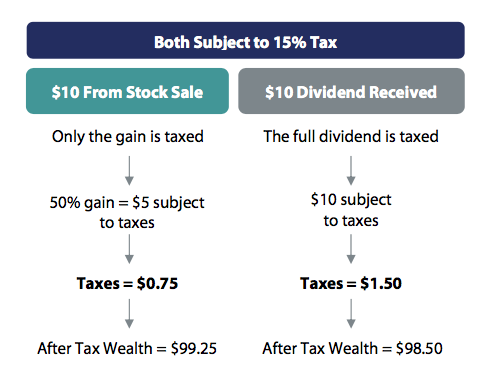 As you can see from the table below, a sale of stock with a 50% embedded gain would generate $0.75 in taxes while the taxes on an equivalent level of dividends are twice that amount. Moreover, the lower the embedded gain, the more money the investor who sells stock will take home compared to the investor who chooses the dividend. Knowing this, a rational investor would actually prefer to sell stock than receive the dividend. Proponents of dividend-focused strategies argue that companies that pay dividends must be, by definition, the most financially healthy. These investors view dividends as evidence of both past success and management’s confidence in the company’s future. As shown in the table below, company management has choices other than using their profits to pay a dividend. For one, they can choose to reinvest the cash into the business, arguably an even stronger signal of management’s confidence and perhaps an even better signal of future profitability. Google and Amazon are two examples of companies that have never paid a dividend but instead reinvest in opportunities for future growth. Another option is to use the profits to buy back stock. A good example of this is Berkshire Hathaway. In 2011, CEO Warren Buffett received backlash from some investors for deciding to buy back Berkshire Hathaway stock rather than issuing a dividend. In response, Buffett pointed out that buying back stock allows shareholders to avoid the less favorable tax treatment of dividends. Additionally, he explained that investors interested in cash flow enjoy more flexibility through selling the number of shares needed to suit their individual spending needs – essentially making their own “home-made” dividend. Because dividend payers are perceived to be more mature, stable companies, many investors believe that investing in these companies is safer than investing in other types of stocks. A risk that may not be obvious with dividend investing, though, is concentration risk. Currently, only about one third of stocks pay a dividend. Further, most dividend payers tend to be mid- and large-cap value companies, a sub-set not representative of the total market. Finally, it’s important to note that in times of financial distress, companies can elect to suspend dividends, further limiting the choices for investors only concerned with income. As you might imagine, the lack of diversification among companies that pay dividends can actually result in increased overall risk. But what about superior returns? One noteworthy study that appeared in the Journal of Financial Planning looked at the performance of a dividend-focused strategy in the 33 years from 1979 to 2012. The dividend strategy did outpace broad market returns by 1.27% a year on average. However, when the returns were further analyzed to see why the strategy beat the market, the authors found that the dividend strategy outperformed not because it focused on dividend-paying companies, but rather because it had an unintended bias to value stocks. According to their findings, if an investor is looking for superior performance versus the market, a surer way to invest would be to look for value, not dividends. Superficially, dividend-focused strategies may appear to be a sound investment choice, but delving into the details demonstrates that they are not the most efficient way to invest. In contrast, total return investing gives investors the flexibility to use both income and appreciation of principal in order to meet their cash flow needs. This comprehensive approach reduces risk by avoiding concentration while also providing for greater tax efficiency. So, if your aim is to invest in what’s truly sensible, stable, and superior, focus instead on the total return and don’t let dividends distract you from your goals.